Welcome Mr. Eugene Wong and Rev. William Cheng to preach the Word of God this Sunday to the English congregation and the Chinese congregation respectively. May God bless them. The Mission Committee is going to meet today, 10/9, 2:00 PM in the 4th floor. The Mission Committee invites you to support the “Operation Christmas Child” to pack Christmas presents for the third-world children who needs your help. If you have shoeboxes with lids, please give them to Eugene. Each box requires a $7 shipping charge. If you want to donate the gifts to fill the box(es) or donate to the shipping fee, please give your generous donation to Eugene. Walgreens and Chinese U.M.C. will hold the flu shot clinic today, 10/9, between 1:00-4:00 PM in the Social Hall. Please bring your picture I.D. If you have any questions, you may ask the pharmacist on duty. The Mission Committee will host the Harvest Festival on Sunday, 10/30, from 2:00-4:00 PM in the Social Hall. Please invite your friends and relatives to join us. Wesley Parents Fellowship will meet today at 12:30 PM in the Chapel. Board of Trustees will meet on Sunday, 10/16 at 12:30 PM in the Chapel. We will have the Joint Choir singing on Christmas Sunday. The Joint Choir will be conducted by Mr. Sidney Wong. Please speak with Mrs. Donna Yee if you would like to join the Joint Choir. Practice will be every Sunday, starting from 10/16, from 12:30-12:30 PM in the Sanctuary. Please stick a label on your personal and fellowship items that are at church before the end of October. The Board of Trustees will have the annual clean-up and throw away everything that does not belong to anybody or fellowship groups. All committees are reminded to submit a 2017 budget request to the Finance Committee before 11/5/2016 for approval. The Staff-Parish Relations Committee (SPRC) will meet son Sunday 10/23 at 12:45 PM in the chapel. The Finance Committee will meet on Saturday, 11/12, at 10:30 AM in the chapel. The Administrative Board will meet on Sunday, 11/13, at 12:45 PM in the chapel. Pastor Kan is taking time off from 10/6 to 10/13 to attend his nephew’s wedding in Toronto, Canada. He also will preach at the Toronto Chinese Methodist Church. You are welcome to check the activities and the pictures of our church on our Facebook page. Nominating Committee will meet on Sunday, 10/2/2016 at 12:30 PM in the Chapel. Mission Committee is going to meet next Sunday, 10/9/2016, at 2:00 PM on the 4th floor. Board of Trustees will meet on Sunday, 10/16/2016 at 12:30 PM in the Chapel. Starting from 10/16, the Christmas Joint Choir will rehearse every Sunday from 12:30 to 1:30 PM. Please let Mrs. Donna Yee know if you will be attending. Please stick a label on your personal and fellowship stuffs that are at church before the end of October, 2016. The Board of Trustees will have the annual clean up and throw away everything that does not belong to anybody or fellowship groups. You are welcome to check the activities and the pictures of our church from our CUMCSF Facebook group. Make sure to join the group and like our page! The Staff-Parish Relations Committee (SPRC) is going to meet today September 18th, 12:30pm in the Chapel. Our next All-Church Luncheon is going to be held today, September 18th after Chinese Worship Service. The Mission Committee is going to meet today, September 18th, 2:00pm in the 4th floor. Mrs. Wandy Mei has kindly accepted our nomination to be the Chair-person of our Nursery Ministry. The Nursery Ministry is very important to our church because it involves our next generation. Parents of the kids who are attending the nursery are invited to be in partnership with Mrs. Wandy Mei to improve our nursery. Nominating Committee will meet on Sunday, October 2nd, at 12:30pm in the Chapel. Board of Trustees will meet on Sunday, October 16th, at 12:30pm in the Chapel. We would like to extend our warmest welcome to you who are attending our Worship Service today, particularly to those who are joining our fellowship for the first time. Newcomers are cordially requested to fill out a registration card located in the slots behind the pews. We would like to thank Rev. Elain Teo to share the message of God this Sunday Service. May the Lord bless her and her ministry. Rev. Elain Teo will share the gospel message this afternoon from 3:00 to 5:00 pm at our church. Please invite your friends and relatives to come. The August simple lunch will be held today after 11:00 am worship. The 9th Comprehensive Art Class session began on Aug 27, 2016. Class Hours are every Saturday from 10:30 a.m. to 12:00 noon, total of 8 weeks. Please contact Esther Huang for more info. Pastor Kan will lead a parent evangelistic class at the same time with the parent. Anyone who is interested to work with the pastor is welcome to talk with the pastor. There will be a prayer meeting after the Chinese worship service every Sunday. If you would like to participate, please gather in the chancel area of the sanctuary. There are yellow prayer request cards at the back of the pew. Please write your prayer request and place it in the offering plate or give it to an usher for the Prayer Team and Pastor. 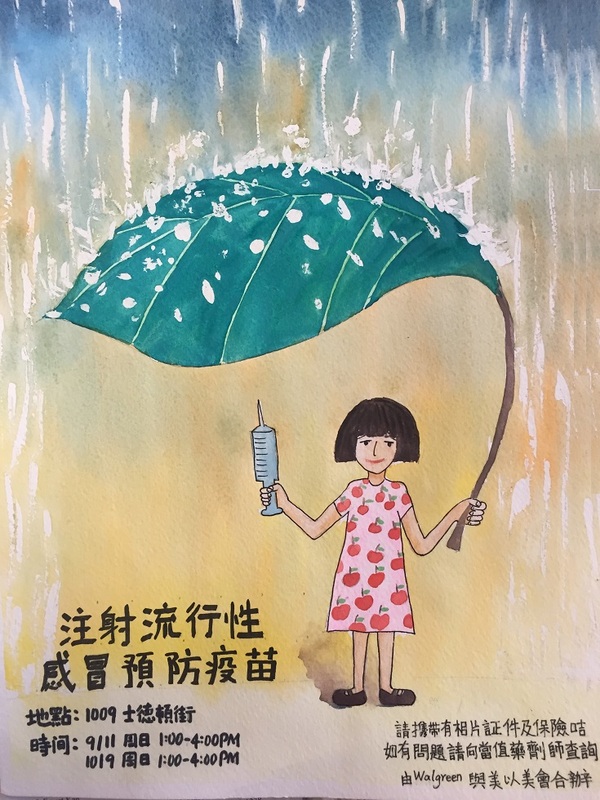 Last Friday, Aug 19, a Chinese mother of two daughters was hit by a fallen tree limb in the Washington Square, San Francisco. Her heard and her spine cord are seriously wounded. Her husband is now staying home to take care of the children. The family is in deep water. San Francisco Channel 26 is calling for donation to support the family. We would like to show our Christian love toward the family by setting up a Charity Fund. The Charity Fund will start collecting a special donation on every Holy Communion Sunday. In the mean time, the church will donate $1,000.00 to the family through KTSF Channel 26. Please let us show our care towards the family. Co-sponsored by Walgreen & Chinese U.M.C will hold the Flu Shot Clinic on Sept. 11th and Oct. 9 between 1:00-4:00 p.m. in the Social Hall. Please bring your picture ID. If you have any questions, you may ask the pharmacist on duty. For those who are interested in becoming Daycamp leaders (or know anyone who does), the application form has been released. Fill out the form in the editable PDF. Winter Festival 2015 is Almost Here! 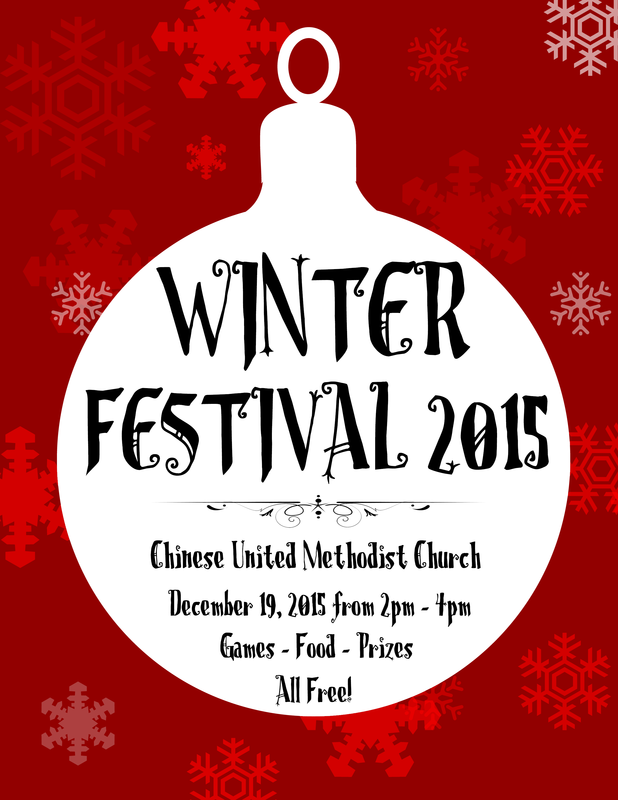 Winter Festival 2015 is almost here! We invite the entire Chinatown community to come join in on the festivities. 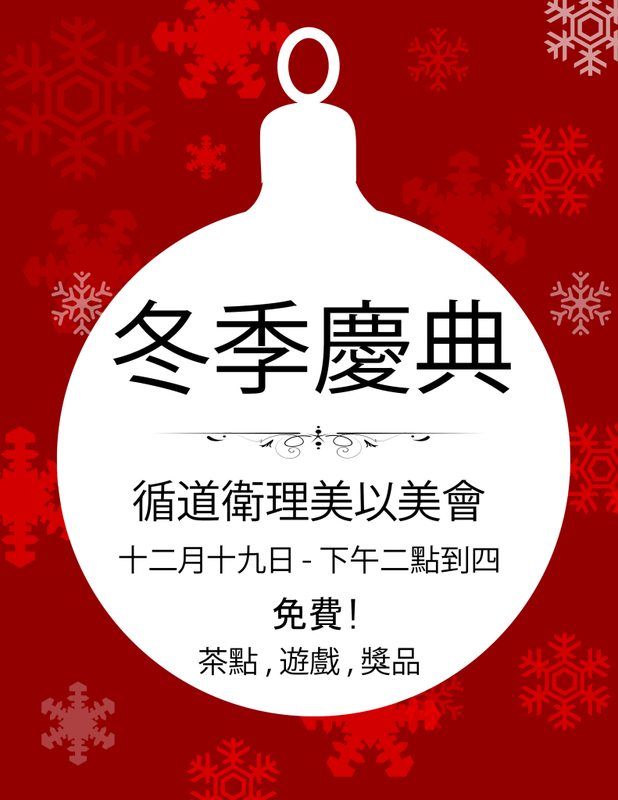 It will be held in the Social Hall – 1st floor of our church – on December 19th, 2015 from 2:00pm – 4:00pm. What goes on during Winter Festival? We will have free food/drinks, prizes, and games! There will also be a photo booth for those who want to take a picture with Santa! And don’t forget to stick around until the end for the raffle prizes! Thank you for visiting our new page! With the launch of our redesigned site, the web team is working hard on gathering information so that visitors and members alike can get the information they need about our church. Our goal is to have this domain be an information hub for potential visitors while still providing updates and announcements for church members. Keep in mind that the site is a work in progress as we will be changing and refining the content on each page for the next couple of months. If you have any suggestions or comments regarding our site, please send your feedback to vinson@cumcsf.org.